Nikos Tsepetis is not only the owner and manager of the popular Ammos Hotel, he is also a lover of good Greek food, as he should be. 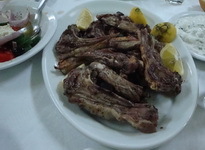 The Ammos hotel has one of the best restaurants you will find in a hotel. Forget what you have heard about lousy food in hotel restaurants. 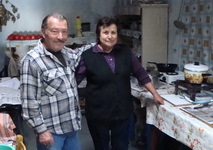 The Ammos has two middle-aged Greek ladies cooking traditional Cretan dishes using local vegetables, meat, fish and of course the excellent olive oil which the island is famous for. 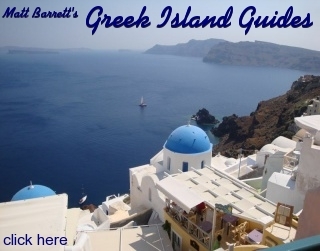 These are his favorite restaurants in Chania and the surrounding area with a few of my own recommendations that I snuck in here in a not very subtle way. Nikos took us out to eat for lunch the day we arrived and every night after that until we left, except one because he said we wore him out. 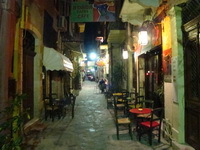 (later he changed his mind and called us to see where we were going but we had already eaten in a place that we found that turned out to be not as good as any of the restaurants Nikos took us too. 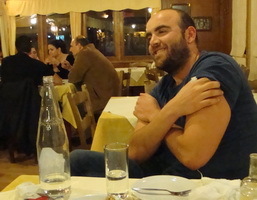 My last meal with Nikos was a classic. He brought me the best souvlaki in Chania when he met me at Starbucks for breakfast. I could not have made this page without him and actually he was the one who suggested many of the places we went on our trips out of Chania. So let me say thanks to Nikos by saying that if you need a hotel on the beach in Chania and you want the owner to be helpful and knowledgeable stay with him at the Ammos Hotel and this will probably be your best holiday ever. But you better act quickly because the Ammos Hotel has been full every time I have tried to book it. This is by far the most successful tavern for the last 20 years, located in an old Turkish bath, amazing interiors and a wide range of yummy mezedes at a fairly good rate. I brought Matt here and he loved it but with all the tsikoudia he was drinking they could have served raw onions on paximadia(dried bread) and he would have been happy. But his wife Andrea, a much more difficult customer loved it as well and you probably will too. Among our favorite dishes is the Iranian rice and the meat pie. It is easy to find in the old harbor on Zambeliou which is the street behind the road that lines the harbor, on the west side of the port near the Jewish quarter. Their phone number is 2821096080 in case you want to make reservations which is not a bad idea if you come here in the summer. Savour the flavor of the old market building (3rd shop as you head for the east gate exit). Run by a mother and her good looking 20-something year old son. Best pork chops in town! Open only until 16h00 daily (closed on Sundays). Fresh fish is an expensive sport in modern Greece. Per kilo expect to pay between 40.00 to 60.00 euros for the better fish. 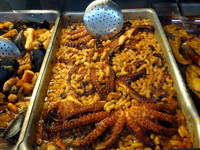 Calamari, octopus, gopa, and small fish (e.g. 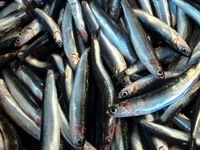 : sardines, gavros, marides) are always well priced and are delicious fried or grilled and are usually the most fresh. Remember that fish goes very well with horta (boiled greens) and in Chania we have many different types depending on the season. Reliable fish and sea food eatery. 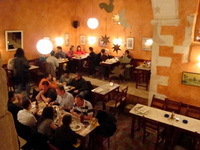 Located on the water-front and favored by the locals (Greeks) this taverna is busy always (even on a Monday night in the winter). This was the first place in town I brought Matt and he seemed to like it a lot. We ordered a variety of fresh grilled fish which is not cheap but Matt seemed to be enamoured with the white taramasalata and the tsikoudia of course. Nice assortment of bottled wines though as with any restaurant the local wine served by the kilo is the best for saving money and often does not suffer in comparison. Matt claims that you are more likely to have a hangover from commercial bottled wine, no matter how lofty the reputation, than from the homemade stuff from the barrel, the box or wherever it comes from. My reply to Matt is that if he did not drink so much he would not have to worry about a hangover and could enjoy good wine for the taste. But I don't think he is the type who is concerned with the subtleties in the taste of fine wines. He does not have, how shall I say it without being too insulting... a refined pallatte, at least when it comes to wine. As for food he does seem to know his stuff the restaurant is between the Venetian Arsenal (Shipyards) and the Hotel Porto Veneziano, the tallest building in the Harbor. And Matt claims the cafeneon at the end of nearby Salpidonos street is a nice quiet place to have a drink before or after dinner. I prefer the less quiet cafe-bars on the street and if you are closer to my age than to Matt's you probably will too. It is customary for the restaurant to give you a complimentary desert, usually fruit or halvah but sometimes you even get loukoumades. They also will serve a complimentary glass of tsikoudia at the end and sometimes even a battle which in Matt's case is like throwing gasoline on a fire. But like the Italian's serving grappa it really is a nice way to end the meal. Snack tavern. Another very simple (plain setting but a huge olive tree in the courtyard makes up for it!) and completely un-touristy tavern in our vicinity - 20 minute walk. 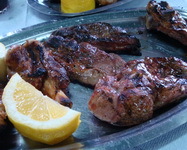 They always have a day’s special and their grilled meat (pork chops, lamb chops, poultry and rabbit-nikos favorite!!! ), gigantic fried potatoes and grilled mushrooms are great. Lunch and dinner. Kali Kardia (which means good heart in Greek) is a genuinely good hearted place with cheap, uncomplicated, cooked by an old couple food and served in 70s house china. The décor is surreal-kitch and that only adds up to the charm (a favorite of Matt Barrett’s). Make sure you take a peak at their traditional kitchen. Matt recommends anything made with goat or served with roast potatoes. To find this place just take the National Road west and follow the signs to Kolimbari and then the village of Afrata which is so small you can't help but find it. 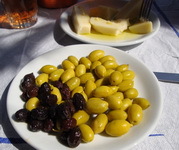 Matt says be sure to drink the wine and eat the small Cretan olives and graviera cheese and be sure you order the Pilafi. If you get lost and speak Greek call 2824022077. Ntounias (which means damn world in Greek) is another fascinating find. You drive through the beautiful gorge of Therisso and you find yourself in what Greece might have looked like 50 years ago. The owner is an avid talker (have that in mind before you get into a endless conversation). You must expect that the owner takes you in to show you his brand new kitchen (he does that with everyone). There are two very nice historical museums in town, one for the war of Independence and the other for World War Two so be sure to visit them. Matt wants you to eat at Amilias which is in the next village of Zourva which also has delicious traditional Cretan food served by an old woman named Amilia and her children who are adults actually. Try the Staka or Anthogalo, not recommended for people with high cholesterol as it is the creamiest of milk products but like eating liquid cheese. Nice fresh salads and a great view. One of my favorite destination for good fresh fish (2 brothers, one serves fish and the other fishes the fish and the mother cooks) in an old fashioned setting, right by the water. 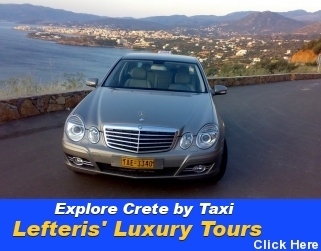 It is nicely combined with a day excursion to Falasarna or Elafonissi beach. Its on the beach at Sfinari on the west coast of Crete, not to be mistaken with the main village of Sfinari which overlooks the beach from the mountain above where Matt went instead, in spite of my SMS message which told him implicitly where to eat. He claims he forgot and instead went to a little roadside family run roadside restaurant called To Kati Alo which he said was simple and good and a true non-tourist experience. He says to ask for their cheese kalitsounia or a potato, tomato and feta omelet. Milia is the most famous mountain retreat in Greece, and rightly so. 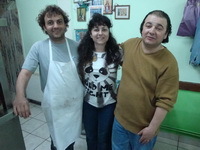 It is worth for a short visit to try their amazing organic products local cuisine in their restaurant. Again nicely combined with Falasarna and Elafonissi beach. Challenging drive and you have to leave the beach early if you want to stop here on the way home. You can also just drive up here for lunch and skip the beach if you like. 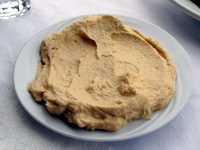 They have some really nice home-made tsikoudia which you can sample and if they have not run out you can probably buy some. They also sell some nice homemade wine and a lot of agricultural products that they grow and make including their extra-virgin olive oil which is quite good. This is located in the village of Maza, Apokoronou and it is, what Nikos calls, “disgustingly” pretty. It is right in front of an amazing 13th century chapel, with an out-of-this-world ‘taverniaris’ (tavern owner) – Kostas. He will open the door to the chapel so that you can see the frescoes. A must-do especially if you are rabbit fans! Maza Apokoronou (near Vrisses), +30 28250 51615 (call before you go). Conveniently located for those who return from Falassarna or Balos: On the way back from Falassarna beach, in the centre of Kissamos (just after the city’s main square), you will find the road sign indicating a right turn; the distance to Polyrinia is 7km. For locals the best souvlaki place is Oasis, a small joint that works only when the surround shops are open and serves a smallish and light souvlaki (Tzanakaki Street, opposite National bank). 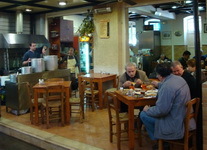 A decent souvlaki can also be found in any of the souvlaki places in the 1866 Square. 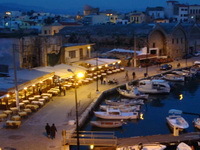 Chania is famous for it’s bougatsa which is different from the bougoutsa in other part of Greece). 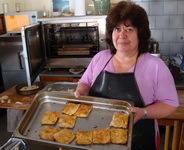 The original Chania bougatsa (the one with mizithra cheese) is from Iordanis (right across the KTEL buses entrance). If you are wines friend and keen to know more about Greek wines then visit Miden Agan (70 Daskalogianni str, +2821027068) or/and their wine tapas bar 36 (Kalinikou Sarpaki str, old harbor, +302821057590). Matt recommends you visit the restaurants at the Public Market which are open for lunch and if you have a hangover try their patsa and if not just choose anything that looks good. His wife Andrea recommends Cusina E.P.E.”(pronounced Eppay), a hip little restaurant located at 25 Thaskalogianni (Plateia 1821), with excellent home cooked food, that is only open in the day. 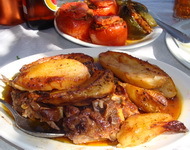 They also say to try Platanos which is the former old man cafeneon of the square which has been converted into a trendy mezedopoulion-ouzeri with a very large menu with cheap but satisfying portions of mezedes and main dishes. 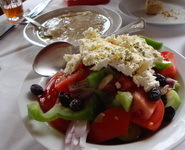 Try their rega (herring) salad for starters and their different types of saganaki, (melted cheese). If you go for that ouzo-meze thing and palio rembetika music then you can also try Mesogiako and For Anna, both on Daliani street in Splantzia. 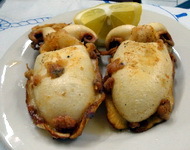 In Crete they have a special kind of tiropita called Kalitsounia which they make with greens or with mizithra cheese. Try them. Also the local wine from around Chania which is called Romeiko is a local and ancient variety of grape and the wine is kind of peach colored with a slight sherry taste. Its pretty unique, often totally organic and can be really good. Tsikoudia and Raki are the same thing and in terms of purity are probably the most natural thing you can drink in Greece. Some people drink it before a meal, some drink it after and some people drink it before, after and during, like Matt for example. 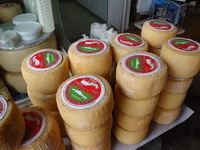 Don't forget that Cretan graviera cheese is the best graviera in Greece so you should get some from one of the cheese shops in the Public Market. Cretan olive oil, sausages and the small Cretan olives are all especially good. 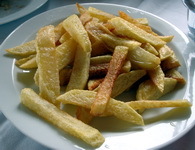 And there are no better fried potatoes in the world than what you will get in Chania. Remember that no meal is complete with fried potatoes and if they are cooked in fresh olive oil there is nothing unhealthy about them. 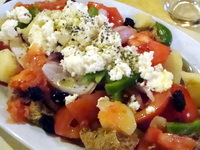 Also order the dakos salad when they have it instead of the horiatiki salad. Its healthier. Try the askralimbi, a kind of horta(wild greens) that tastes better than it looks. The saligari are your common edible garden snails and Matt says if you have the choice get them stewed and not deep fried. He also says whenever you get the chance, eat goat. I hope this makes your stay in Chania more enjoyable. If you like good home cooking come to visit my hotel where we have one of the best beach restaurants in the area. Do you enjoy using my site? Have you found it entertaining as well as useful? If so please show your appreciation by booking hotels through the travel agencies and the links found on my Chania Hotels page. The small comission I make on the bookings enable me to keep working and in most cases you won't find them any cheaper by searching elsewhere. You can find hotels, apartments, rooms and even houses through Booking.com's Chania Pages which also contributes to my website when you book.